If you ever find yourself looking for ways to use hot cocoa powder, here’s a good one from the side of the Jet Puffed Mallow Bits canister. Or sort of. I changed it by halving the recipe, using a combination of chocolate and white chips and cutting down on the marshmallows. I also used a higher ratio of cocoa powder and was pleased with the results. Hot Cocoa Cookies don’t taste like typical double chocolate cookies, but rather a cup of hot cocoa drink in edible form. For a cookie we made basically to use up a surplus of hot cocoa powder, these were a hit! 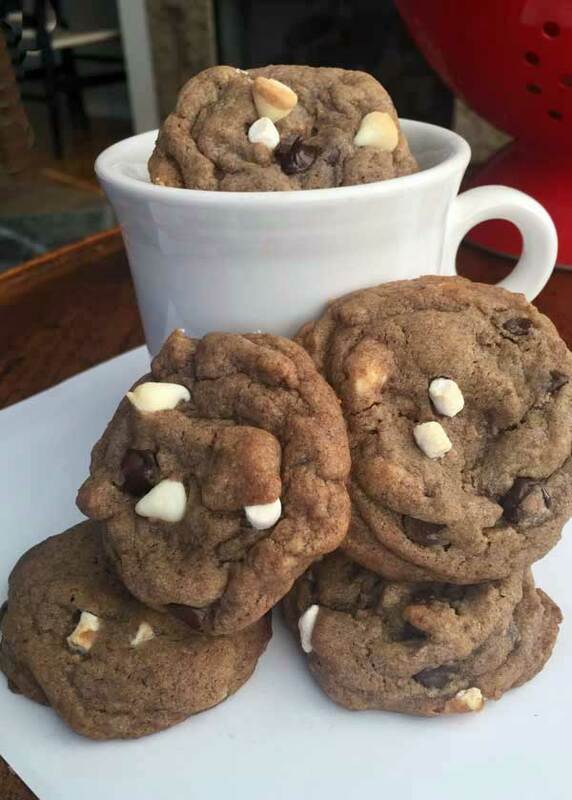 Hot Cocoa Cookies are cocoa flavored cookies made with powdered hot cocoa mix and lots of chocolate and white chips. Any brand of cocoa powder will work so long as it is not sugar free and you use around 56 grams (3 tablespoons). In a mixing bowl, using an electric mixer, beat the butter, and sugars until smooth. Add egg and vanilla and beat until combined. In a separate bowl, mix the flour, hot cocoa mix, salt, baking soda and baking powder. Add dry ingredients to creamed ingredients and stir until blended. Stir in the chips and marshmallow bits (if using). Scoop up about 28 slightly rounded tablespoons of dough and arrange on parchment lined baking sheets. Bake one sheet at a time for 10-12 minutes or until cookies appear set and cracked. Let cool on baking sheet for about 3 minutes, then transfer to a wire rack. I thought these tasted best when completely cool. Hooray! Glad you liked them. I finally got around to making these today. Yummy taste and texture. We really like them! Thanks! I actually used an assortment of cocoa which I emptied from K-cups. One of the main ones was called Grove Square Hot Cocoa Mix. Anna, did you use a rich cocoa mix like Starbucks sells or more like a Swiss Miss? Sonya, definitely try them next time you have some cocoa to use up. Emily, I’m so happy you liked them. Thanks again for the raspberry vinegar! You always bring such nice things to the swap. If there was a way to grab one of these through the screen, I would be eating one right now! These are SO good. They really do have the taste of hot cocoa. I devoured two right after the food swap and was tempted just to finish the rest.